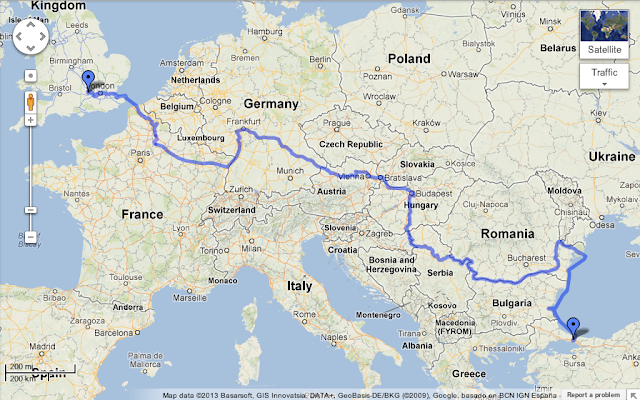 This is the journey of Giacomo De Stefano, 47 years old. No engine : only wind and human force. To rediscover the importance of river waters and to show the beauty of slow traveling, respecting nature. A Royal Navy survey ship has discovered a previously uncharted 250-metre-deep canyon on the floor of the Red Sea. 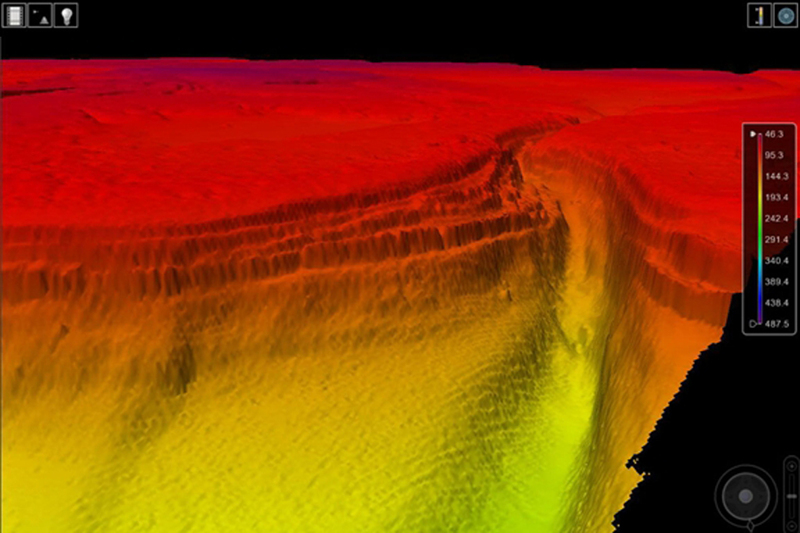 HMS Enterprise has produced a series of stunning images of a Grand Canyon-style ocean floor hidden deep under the Red Sea. The vessel used her state-of-the-art surveying equipment to reveal the natural wonder during her nine-month mission to improve understanding of the waters east of Suez. 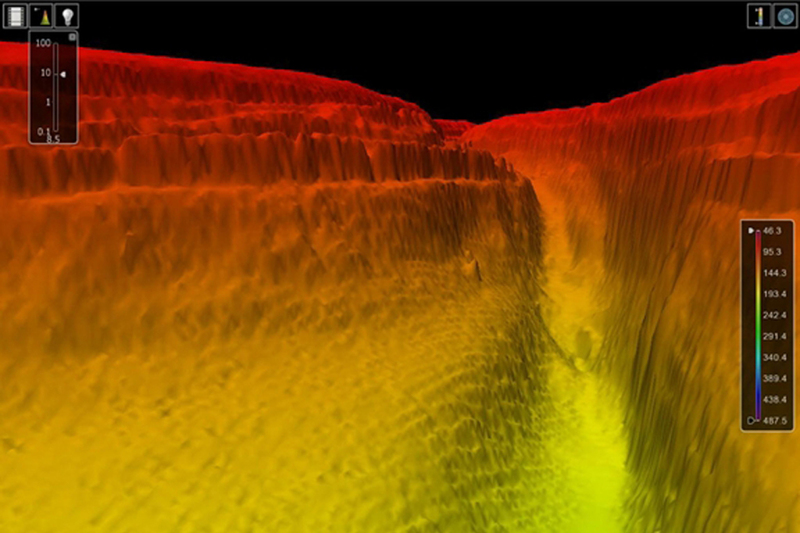 Discovering the 250-metre-deep canyon after leaving the Egyptian port of Safaga, the ship used her sophisticated multibeam echo sounder to create the 3D images, allowing the ocean floor to be seen for the first time. "These features could be the result of ancient rivers scouring through the rock strata before the Red Sea flooded millennia ago. Some may be far younger - and still in the process of being created by underwater currents driven by the winds and tidal streams as they flow through this area of the Red Sea, carving their way through the soft sediment and being diverted by harder bed rock. 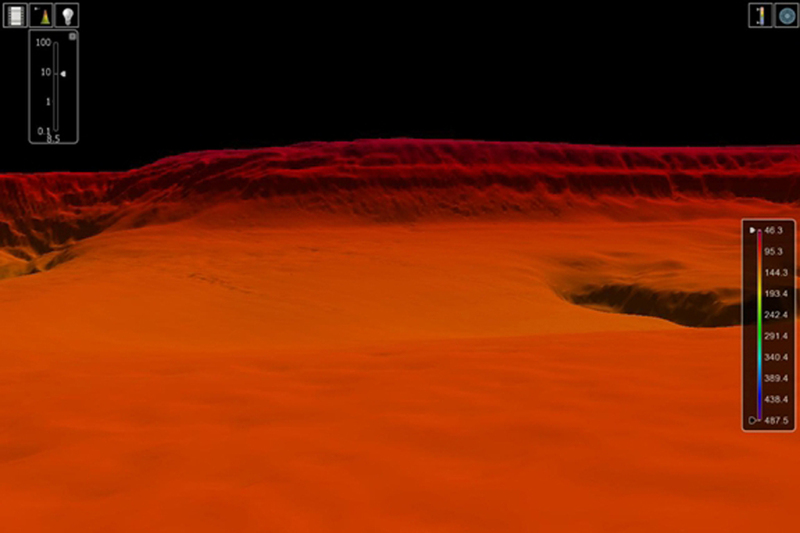 It is, however, almost certain to say that this is the closest that humans will ever get to gaze upon these truly impressive sights hundreds of metres beneath the surface." The echo sounder, which is fitted to Enterprise’s hull, produces the images from the echoes returning from the sound pulses it sends out. This is a highly accurate way to measure the sea bed to determine if the depth of water is safe for navigation and shipping. This was the first time HMS Enterprise has visited Safaga, which lies on the western shore of the Red Sea - approximately 250 miles south of Suez. Safaga is the headquarters of the Egyptian Navy’s Red Sea Command and the ship’s company attended both formal and sporting events to ensure regional links are strongly maintained. HMS Enterprise will remain in the Middle East until the summer, building on the successes of her sister ship HMS Echo, which discovered numerous wrecks and obstacles during a 19-month deployment to the same region. As well as helping to update some of the 3,300-plus Admiralty Charts which are used by many of the world’s seafarers (including the Royal Navy), the survey ship will also support the wider international naval effort to prevent piracy and other criminal activities in the Indian Ocean and environs. The entire Maldives nation has pledged to become a United Nations Educational Scientific and Cultural Organization (UNESCO) Biosphere Reserve. The Maldives, an archipelago southwest of India, plans to implement the reserve plan on more than half of its islands by 2017. North and South Malosmadulu Atolls are in the Maldives, an island republic in the northern Indian Ocean, southwest of India. Maldives is made up of a chain of 1192 small coral islands that are grouped into clusters of atolls. It has a total area of 298 sq. To become an official UNESCO Biosphere Reserve, the Maldives must follow guidelines set forth by the UN’s Man and the Biosphere Program and the UN’s Convention on Biological Diversity (CBD). The Biosphere Reserve’s strategy must integrate management of natural resources with conservation and sustainable use. The plan also must seek to ensure equitable distribution of natural resource wealth. Currently, there are 610 biosphere reserves in 117 countries. “This pledge from the Maldives is extraordinary in size and potential impact,” said CBD Executive Secretary Braulio Ferreria de Souza, in a press release. The president of the Maldives, Mohammed Waheed Hassan Manik, was inspired to pledge his entire nation’s intention to become a Biosphere Reserve after the success of the reserve formed in the Maldives Baa Atoll, according to the UNESCO press release. The Maldives are a low-lying chain of islands and are seriously threatened by rising sea levels. 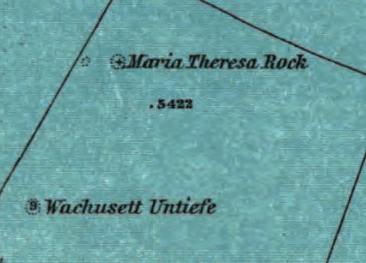 The highest point on the island chain is only 2.4 (7.8 feet) meters above sea level. The capital of the Maldives, Malé, lies approximately 2 meters (6.6 feet) above sea level. Other residential and commercially developed parts of the nation are less that 40 centimeters (16 inches) above high tide. The Intergovernmental Panel on Climate Change‘s conservative estimates for sea level rise are 22 to 44 centimeters (8 to 16 inches) above 1990 levels by 2090. However, a 2009 paper published in the Proceedings of the National Academy of Sciences warned sea levels may rise between 75 and 190 centimeters (30 to 75 inches). Even the most conservative estimate will result in much of the Maldives going the way of Atlantis. 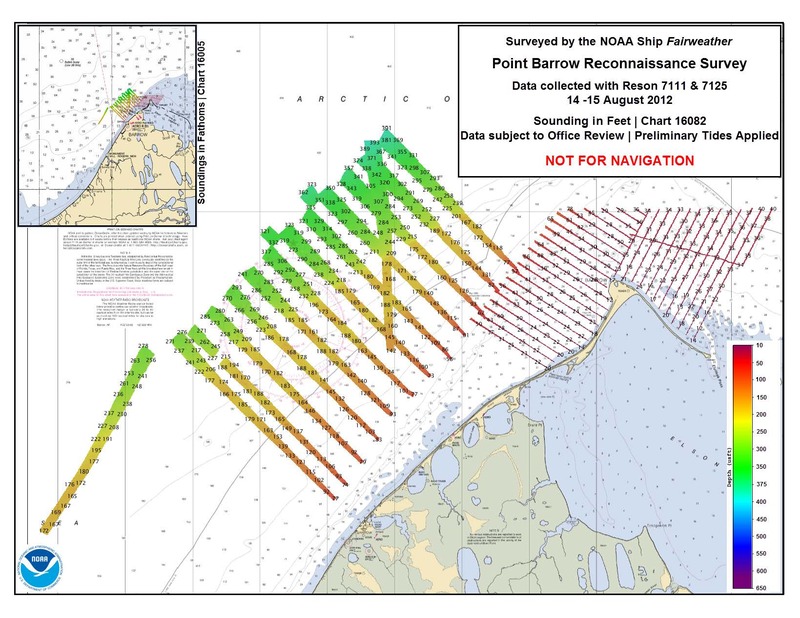 NOAA’s Office of Coast Survey has issued an updated Arctic Nautical Charting Plan, as a major effort to improve inadequate chart coverage for Arctic areas experiencing increasing vessel traffic due to ice diminishment. “As multi-year sea ice continues to disappear, vessel traffic in the Arctic is on the rise,” said Rear Admiral Gerd Glang, NOAA Coast Survey director. “Given the lack of emergency response infrastructure in remote Arctic waters, nautical charts are even more important to protect lives and fragile coastal areas,” Glang said. 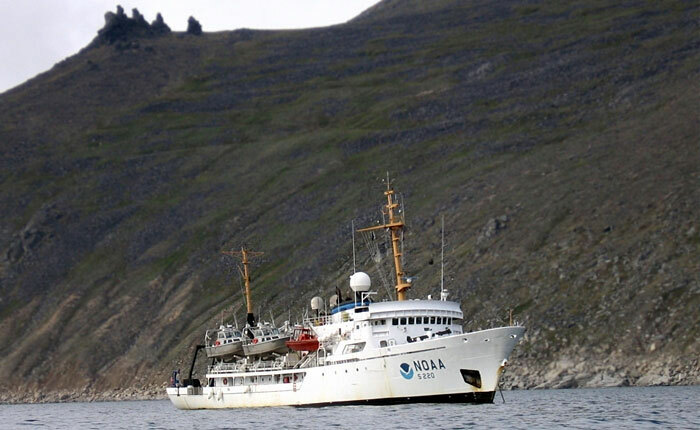 Commercial vessels depend on NOAA to provide charts and publications with the latest depth information, aids to navigation, accurate shorelines, and other features required for safe navigation in U.S. waters. But many regions of Alaska’s coastal areas have never had full bottom bathymetric surveys, and some haven’t had more than superficial depth measurements since Captain Cook explored the northern regions in the late 1700s. 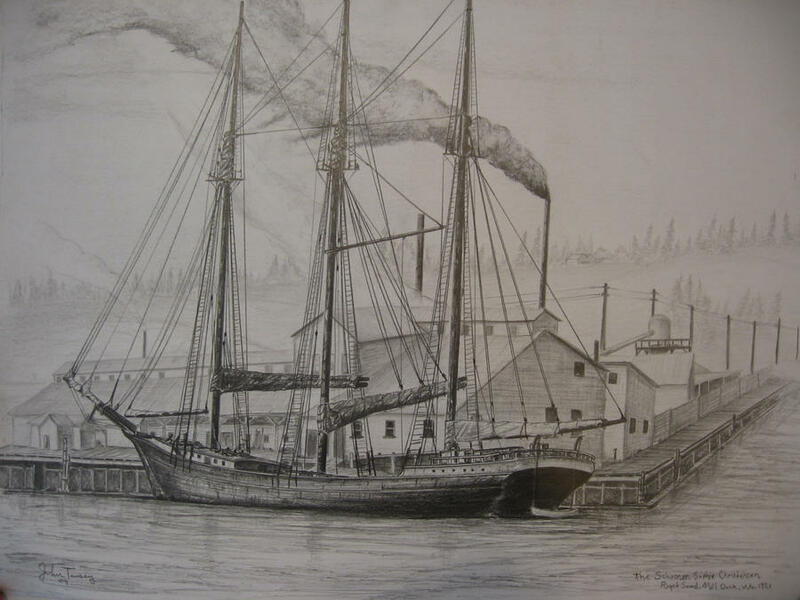 “Ships need updated charts with precise and accurate measurements,” said Capt. Doug Baird, chief of Coast Survey’s marine chart division. NOAA plans to create 14 new charts to complement the existing chart coverage. 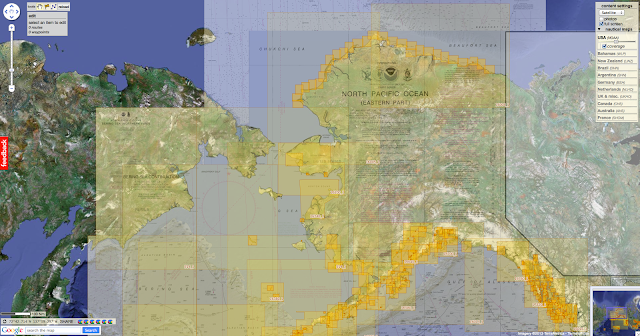 For example, seven of the charts will complete chart coverage from the Alaska Peninsula to Cape Lisburne at the edge of the North Slope, and more charts support the future maritime transportation infrastructure in the coastal areas north of the Aleutian Islands. Mariners and the interested public can submit comments through the Coast Survey Inquiry and Discrepancy System online. NOAA’s Office of Coast Survey is the nation’s nautical chartmaker. 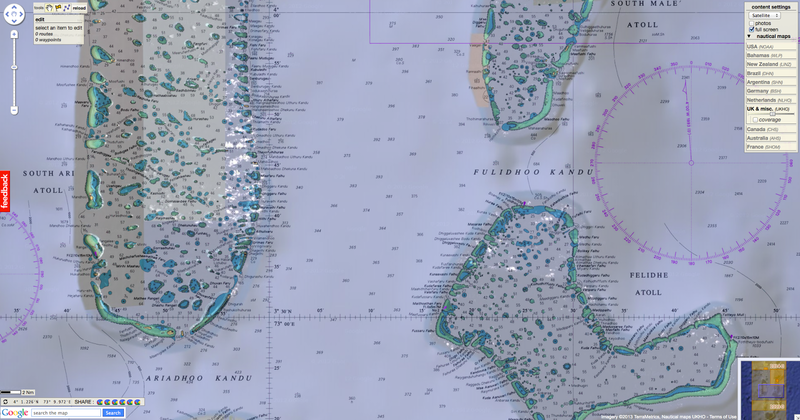 Originally formed by President Thomas Jefferson in 1807, Coast Survey updates charts, surveys the coastal seafloor, responds to maritime emergencies, and searches for underwater obstructions that pose a danger to navigation. 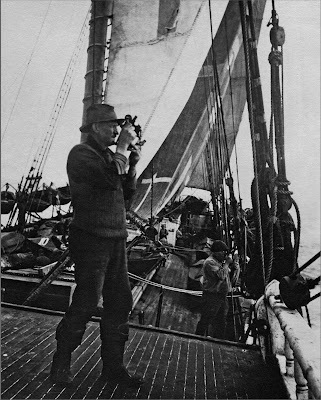 Follow Coast Survey on Twitter @nauticalcharts, and check out the NOAA Coast Survey blog at http://noaacoastsurvey.wordpress.com for more in-depth coverage of surveying and charting. Capt. Wayne Jarvis says the beacon first started off going off this morning at 12:49 a.m. Emergency beacons can be activated manually or automatically by either being knocked or hitting the water. The beacon is registered to the MV Lyubov Orlova but whether that means it’s on the ship itself or was on a lifeboat that was on the vessel is uncertain. A life raft with the beacon could have gone overboard causing the beacons to activate, says Jarvis. “It could have banged itself into operation. On the other hand maybe the vessel sank. Everything is speculation at this point,” says Capt. Jarvis. The location of the dead cruise ship has been a mystery since it drifted into international waters earlier this month. 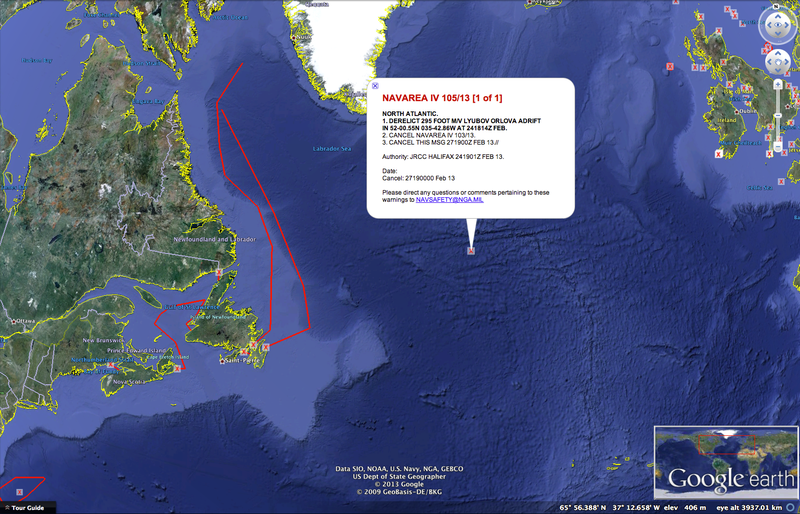 Canadian officials haven’t had a positive location on the ship since February 4. The Irish coast guard has been working with a number of satellite and geospatial companies to try and locate the ship out of fear it might be drifting towards their shores. The Irish coast guard thought perhaps they had found the vessel and that it was heading more toward Iceland but whether what they found was the Orlova is now bing called into question. On Friday 22, a document published by the National Geospatial-Intelligence Agency, an agency of the US Department of Defense, said they had located the Orlova about 2,400 km off the west coast of Ireland. Their position puts the Orlova at 49°22.70' N / 044°51.34' W.
Where is Lyubov Orlova ? Altimeters emit signals to Earth, and receive the echo from the sea surface, after its reflection. The sea height is represented by the distance satellite - surface and the satellite's position relative to an arbitrary reference surface (the reference ellipsoid). Some location systems like Doris enable to determine the satellite's position at a high accuracy. We have also to take into account the disturbance suffered by the wave radar. The measurement of these disturbances (by others instruments, or by using multiple frequencies), or their estimation with models, can correct the altimetry measurement. The French-Indian SARAL/AltiKa altimetry mission has been launched yesterday from the Satish Dhawan Space Centre in southern India. Its goal is to enable closer monitoring of sea-surface height from space. The SARAL/AltiKa project is a collaboration between France and India in the environment monitoring domain. On a platform developed by the indian space agency (ISRO), two independant payloads will be embarked, ARGOS-3 and AltiKa (+DORIS, +LRA), but their missions have the save objective: to promote the study of the environment from space. ARGOS-3 is an element of the ARGOS system, dedicated to localisation, acquisition and distribution of environmental data. AltiKa is an innovating Ka-band altimeter system, dedicated to accurate measurement of ocean surface topography. It is envisioned as a successor of RA-2 instrument on board ESA's satellite ENVISAT. The AltiKa project is part of a French program of operational oceanography development including notably the deployment of in situ measurements (CORIOLIS project) and the implementation of an analysis and forecasting center (Mercator Ocean). These two programmes are the French contribution to GODAE (Global Ocean Data Assimilation Experiment), first international operational oceanography experiment. Thanks to the work of the French and international community, diverse applications of modeling/assimilation systems such as Mercator Ocean are in operation to begin to answer the scientific needs as well as civil or defense operational applications. Altimetric payload: an altimeter-radiometer (AltiKa), Doris and a laser reflector for precise orbitography; ARGOS payload: Argos-3 instrument. Measurement of ocean surface topography, surface wind speed, surface wave height. Contribution to ARGOS system continuity for collect and distribution of environmental data. Altimetry is a key observation parameter of the system and continuity of observations is a critical factor of its efficiency. A participation to the permanent observation system that will feed operational oceanography thus constitutes a major objective of AltiKa. The definition and implementation of the Marine Core Service of the GMES program within the MyOcean2 project (in the continuity of the MERSEA project), gives even more importance to this goal. The data processing will be integrated to the CNES ground segment "SALP" (Système d'Altimétrie et de Localisation Précise), which already operates the altimetry missions Topex/Poseidon, Jason-1, Envisat, GFO, and Jason-2. SARAL/AltiKa will fly on the same orbit than ENVISAT, to ensure a continuity of altimetry observations in the long term. On the other hand, the local time of passage over the equator will be different due to specific cover requirements for the instruments constellation of ARGOS system. This video shows how they use a Secchi Disk to determine how deep light is penetrating in to the water. This gives an indication of the water clarity and how much primary production (plankton) may be present. In turn, this can be related to sightings of filter feeders such as basking sharks. Plankton are microscopic organisms, key to the marine food chain, but research suggests they are in decline. Researchers at Plymouth University's Marine Institute want seafarers to help measure the quantity of plankton. The results will "help us understand how life in the oceans is changing", said project leader, Dr Richard Kirby. Scientists fear that the population of phytoplankton in the world's oceans is being affected by rising sea temperatures, with a paper published in the journal Nature in 2010 controversially suggesting that it had declined by as much as 40% since the 1950s due to climate change. If this is the case it would have damaging consequences for every aspect of marine life, say researchers. But data on phytoplankton populations is sparse. The Plymouth team hope that the readings taken by seafarers will ultimately allow them to test the theory. The organisms are microscopic, thinner than a strand of human hair, but in large numbers they make seawater cloudy. 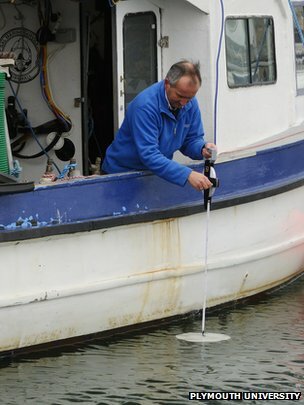 In order to measure their populations, seafarers are being asked to drop a white disk over the side of their boats attached to a measuring tape. They are asked to record the depth at which it disappears from view, and upload the figure to a mobile app. This information will help scientists estimate the amount of plankton in the sea and how it varies from place to place and year to year. Along with the Secchi App, all you need do to take part is make a very simple piece of scientific equipment called a Secchi Disk and use it to record the Secchi Depth when you are at sea. 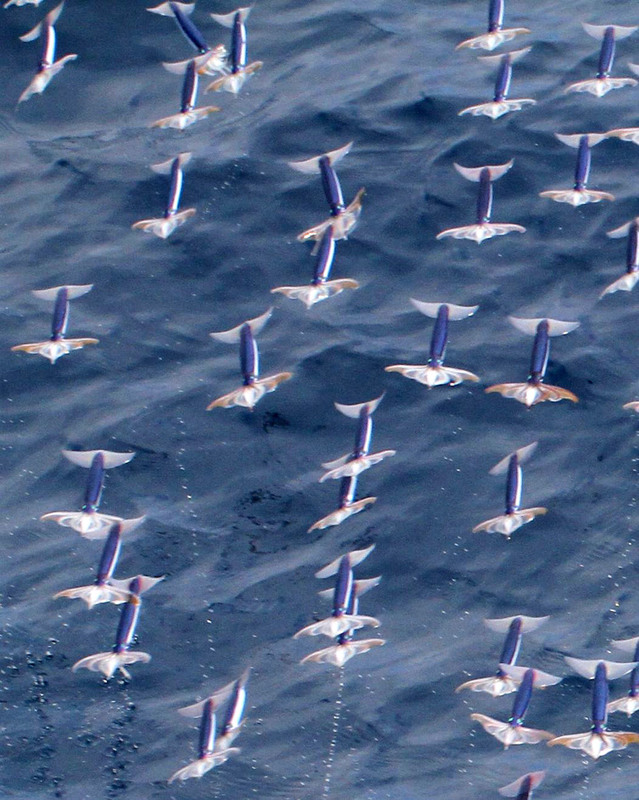 "There are too few scientists to survey the world's oceans as well as we would wish," said Dr Kirby. "This app enables seafarers around the world to take part in a science project and if we can just get a small percentage of the global population of sailors involved, we can generate a database that will help us understand how life in the oceans is changing. It would help us learn much more about these important organisms at a crucial time when their habitat is altering due to climate change." "We hope people will take part for many years to come." Ultimately the plan is to build a map of the oceans to record seasonal and annual changes in plankton populations. The scientists are hoping that sailors will be prepared to make their own measuring disks which they stress should be 30cm (11.8in) in diameter for uniform measurements. The app is named after the inventor of the measuring disk, Father Pietro Angelo Secchi, who used it to gauge the cloudiness of the Mediterranean in 1865. Sailors are asked to take readings whenever they can, but to avoid taking measurements in estuaries. The data they collect will upload automatically onto the Secchi Disk database once they return to port and get a network connection. If you think there's something a little fishy about one of the penguins in the picture below, you're not wrong. Because the bird on the right isn't a real penguin at all, but a hi-tech robot with camera lenses hidden in its eyes. Award-winning filmmaker John Downer used 'Penguin-cams' to infiltrate colonies of Rockhoppper and Emperor penguins in Antarctica -- and obtain stunning shots of never-before-seen behaviour. Despite drawing a few quizzical looks, the so-called 'Penguin-cam', which has camera lenses in its eyes, was able to waddle in and mingle with the real birds. It was also used to 'lay' an 'Egg-cam', which successfully captured charming images of a six-week-old chick peering into it through natural curiosity. Mr Downer used an array of 50 spy cameras, the most advanced of which cost up to £100,000, to film penguins in Antarctica, the Falkland Islands and Peru. They included an 'Egg-cam', an underwater 'Penguin-cam' and a 'Toboggan-cam', a full-sized Emperor model which can join a group of real birds by slithering in on its stomach -- in fact a motorised sledge. Mr Downer said: 'We also employed an underwater 'Penguin-cam' so that we could follow these amazing creatures in their mission to find a safe place to nest and raise the chicks. 'In Antarctica, the emperors brave treacherous sea ice and a trek across the ice of up to 100 miles before huddling together to survive 90mph winter blizzards. We were with them all the way. 'In some of the most moving scenes, we filmed the plight of females who had failed to find a mate or had lost their eggs. 'We witnessed single females doing their best to break up couples by physically disrupting them during mating. Later, alone and without young of their own, they would resort to chick-napping. A chance to see amazing images from deep inside the frozen seas of Antarcica. BBC natural history masterpiece Planet Earth charts the gruelling and heroic winter life of the emperor penguin in almost impossibly cold temperatures.